When it comes to web browsing, Firefox and Chrome happen to be the first names to strike our mind. A decade ago they were nowhere in the picture and the only web browser we knew about was Internet Explorer. But with better technological advancements Firefox and Chrome have managed to keep in pace whereas IE somehow became somewhat obsolete for users. Since then, there has been a cutting edge competition between these two major web browsers—Mozilla Firefox and Google Chrome. Picking between these two has always been a tough call! 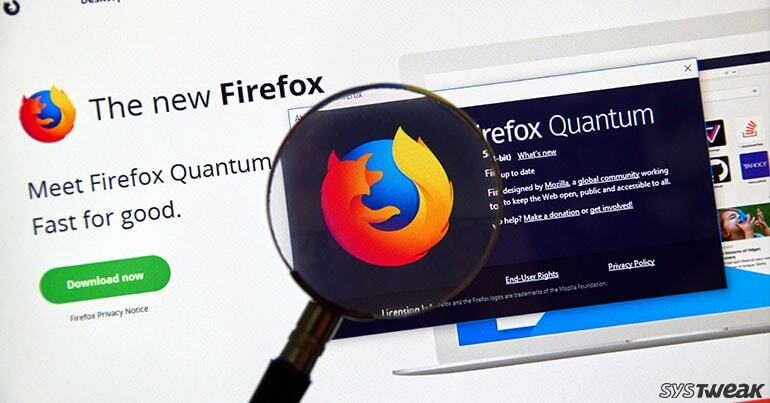 Recently, Mozilla Firefox released their latest update known as “Firefox Quantum” which promises to improve your overall browsing speed like never before. Firefox Quantum is a lightning fast multiprocessor browser with an all new design and interface. If you were not a big fan of traditional Firefox design, then Quantum my friend is all you need! Let’s hear out a few reasons why Firefox Quantum is a better choice than Chrome. Not fast but the fastest! Using Firefox Quantum will be a one of kind of experience indeed. You’ll be amazed to see the lightning speed which is 2X faster than the previous Firefox version. Even the tests have shown how this multitasking browser easily performs all its task and operations at the same time. As per company’s benchmark results Quantum happens to be faster than Chrome as well. Firefox researchers have quite proudly proved that the memory consumption by Quantum happens to be 30 percent less than Chrome. This is one noticeable improvement by Firefox as compared to Chrome, Windows 10 and Linux. Despite being a multiprocessor browser, managing maximum of four processes at a time Quantum’s memory usage is still comparatively less than other web browsers. As Quantum is a powerful web browser it loads multiple web pages at the same time. Just like multitasking is easy, managing between tabs is also faster. As reported, Quantum was able to open nearly 1,700 separate browser tabs in just 15 seconds. After using Quantum you’ll totally forget about the traditional Firefox design. It features all the blocked tabs on the top along with a wide search bar in the middle. Not just this! Quantum also offers various attractive themes to choose from. Quantum has also introduced a new tool which makes capturing screenshots much simple than before. Earlier Firefox has been utilizing Yahoo as its default web search engine. In any case, that finished with the dispatch of Quantum. So despite the fact that the new program is an unmistakable contender to Google Chrome, Mozilla still chose to give its clients default access to the tremendously well known Google search. Firefox Quantum is by far web’s most popular web browser—a run for its money. So fellas, here were the 5 reasons which proves that Firefox Quantum is far better than Google Chrome. Don’t believe us? See it out yourself, give it a try and feel free to share your feedback about how much you liked it! Does Disk Cleanup Delete Everything From The Temp Folder?